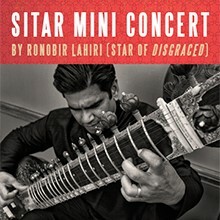 In addition to playing the leading role in Disgraced, Ronobir Lahiri is an accomplished and innovative sitar player. Using elements of raga and tala theory, his live mini concert explores the tension between computer generated music and human emotion. By overlaying traditional Indian ragas onto ambient, house, techno, and club tracks, he seeks to create a sound environment that is intense yet soothing, joyful yet profound, uplifting yet understated. Join Ronobir for an evening of beautiful and transformative sitar music.